That’s the tagline that Specialized have touted since the release of the first Venge aero bike ahead of the Milan-San Remo race back in 2012, marrying the responsiveness of the American company’s Tarmac road bike with a healthy dose of speed and extra stiffness. That bike came out of the blocks at full speed, propelling Matt Goss to victory in its very first race, and was an absolute cracker of a machine. The second Venge was more problematic. Now equipped with their very own wind tunnel, Specialized’s engineers set out to build the fastest road bike they could. They succeeded – the Venge ViAS was an exceedingly fast bike. However, it was a flawed beast. The complex tube shapes meant the bike was fairly heavy, dulling its performance on anything but a pan-flat course. The quest for pure speed led the design team to create an integrated cockpit that was an aerodynamic masterpiece – down to the -17 degree aero-optimised stem angle and completely hidden cables. However, simple tasks like changing cables or altering stack height took hours rather than minutes as a result. The cockpit was also somewhat flexy and heavy: when this was combined with some issues around brake performance on the rim brake version of the bike, it’s fair to say the Venge ViAS didn’t inspire confidence in its handling. Therefore, the design nerds at Morgan Hill may have felt some pressure when it came to designing the third-generation Venge. How to make the bike not only faster (of course), but also lighter, better-handling, and easy to work on and live with? As with many things these days, the answer lies in a computer. 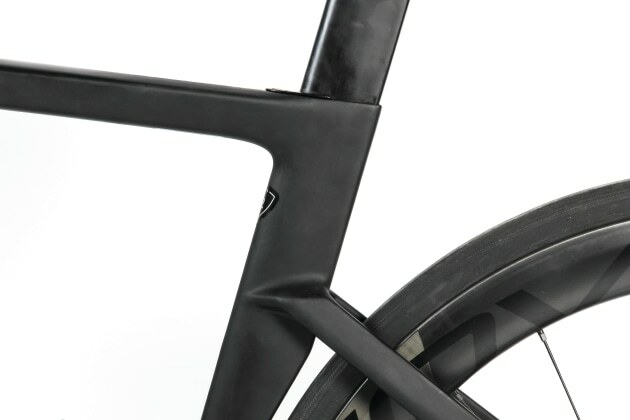 Rather than head straight to the wind tunnel, as with the ViAS, Specialized used a supercomputer to crunch the numbers and find the tube shapes that had the best combination of aerodynamics, stiffness and weight for each part of the new Venge frame. 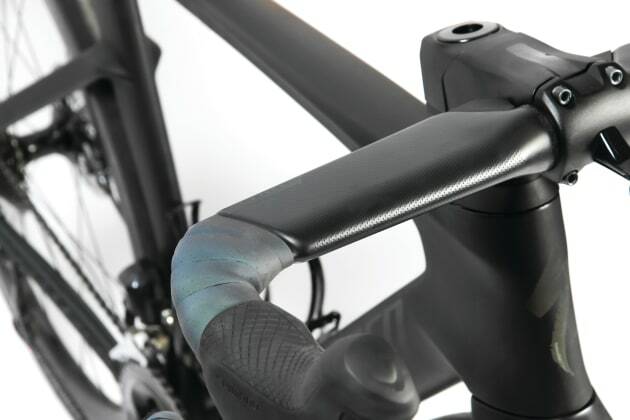 Lighter and stiffer handlebars were also designed that would provide the benefits of fully-hidden cables without being a pain in the backside to work on, along with a new stem that is reportedly stiffer than the pro sprinter’s stem of choice, the Zipp Sprint SL. The result is the new Venge. It’s certainly a cleaner-looking bike than the previous iteration: the tube shapes are pared-back and sleek-looking. The holographic decals, bar tape and saddle on our Pro-level test bike also garnered plenty of attention at the brew stop. If ‘looking fast while standing still’ was a design goal, the Specialized team definitely succeeded. The new Venge is certainly more user friendly. For a start, you can actually take the handlebars off to put the bike in a travel bag or box! The new cockpit routes Di2 wires and brake hoses (not cables – more on that later) through the Aerofly II bars, under the stem in a dedicated recess and into twist-apart headset spacers (similar to those used on the BMC Timemachine and the Trek Madone). This allows for easy fit adjustment while still gaining the substantial aero benefits of a clean front end. You can also remove the Specialized cockpit and install a traditional bar/stem combo if desired. Specialized has also resolved the cabling issues in one fell swoop: don’t have any cables. The new Venge frame only accepts electronic groupsets and disc brakes. 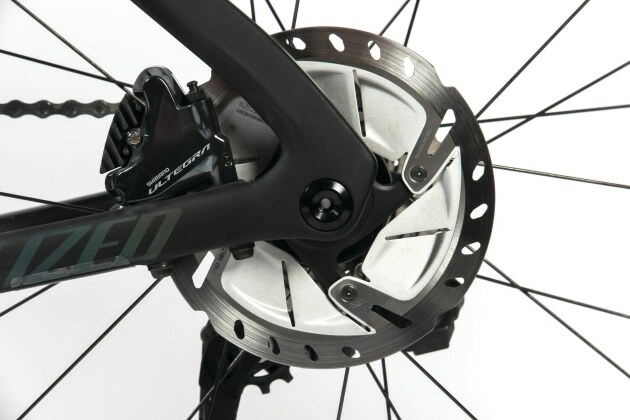 This makes a lot of sense, even if it might offend traditionalists: most maintenance on disc brakes can be done without removing hoses, and electronic groupsets tend to need less ongoing maintenance than cable systems (unless a part fails). 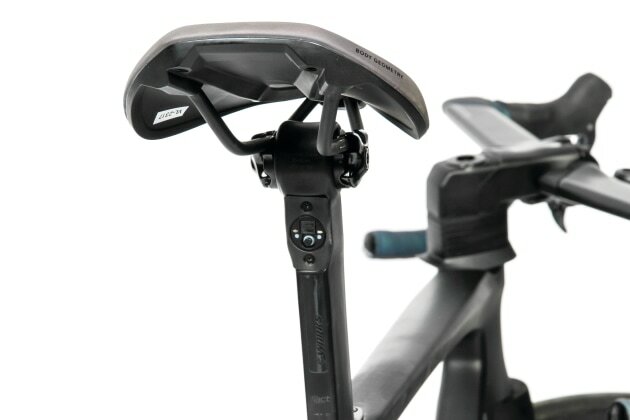 Another interesting move is the positioning of the Shimano Di2 junction box in the seat tube rather than in a bar end, making it less likely to be damaged in a crash while still remaining accessible. While our 52cm test Venge Pro uses the same frame and cockpit as the $14,500 S-Works model, it is equipped with Roval CL50 wheels rather than the deeper Roval CLX64 wheels, and a full Shimano Ultegra R8070 Di2 groupset (with PraxisWorks bottom bracket adapter) rather than the Dura-Ace R9170 Di2 groupset and S-Works carbon power cranks on the S-Works. Specialized Australia told us they’d weighed a 54cm S-Works Venge at 7.1kg without pedals; our scale measured the 52cm Pro at 7.4kg. This seems about right given the equipment differences – and is certainly lighter than many other disc-equipped aero bikes. That’s a lot of tech talk, but how does the Venge react on the road? It’s a blast. It is quick – so very quick. Most aero bikes – most bikes equipped with deep-section wheels, in fact – will carry speed effectively once you get above 30kph; however, the Venge feels almost effortless to pedal at higher speeds. Tuck into a fellow rider’s slipstream in a fast-moving bunch and you’ll be soft-pedalling almost straight away, such is the aerodynamic efficiency of the setup. From the first few pedal strokes, it’s clear that this is a super-responsive, nimble bike. The lighter, stiffer and surprisingly comfortable cockpit certainly contributes to this, giving the front end a flickable, lively feel. The bottom bracket is just as stiff, seemingly transferring every last watt to the drivetrain. This thing veritably leaps forward when you push down on the pedals – perfect for those ‘last-gasp’ sprint efforts. Descending is a joy. The sharpness of its handling means that the bike is incredibly surefooted when plummeting at speed, hooking into corners with confidence and ease. Coming from a rim brake bike, I was reminded (yet again) of the braking superiority of discs, braking later and later into corners. 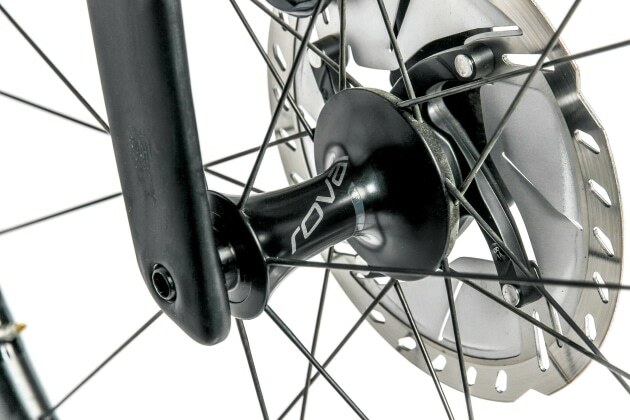 Special mention for the additional stiffness of the Venge’s thru-axles, too: I experienced minimal wheel flex when cornering and very little brake rub under torque, both of which were common occurrences when riding disc bikes with quick-release skewers. Based on this experience, it’s now pretty hard to argue for rim brakes on any criteria other than weight. That stiffness also translates into surprisingly good climbing performance for an aero bike – and the relatively low bike weight certainly makes it a sprightly ride when pointed skyward. The addition of a 30t cog on the rear cassette made life a little easier on steeper inclines. There’s no fear of the Pro spec being the ‘budget’ setup, either: you’re still firmly in superbike territory. The performance of the R8070 Ultegra Di2 groupset is barely distinguishable from the Dura-Ace R9170 series. The use of 50mm wheels, rather than the 64mm wheels specced on the S-Works, makes the Pro a more versatile bike for the majority of riders. The tubeless-ready Roval CL50s are deep and wide enough (29mm external width!) to complement the aero frame and maximise its benefits at speed, but not so deep that they’re slow to spin up or particularly troublesome in crosswinds. Saying that, smaller riders may find that the bike needs a bit of manhandling in windy conditions. 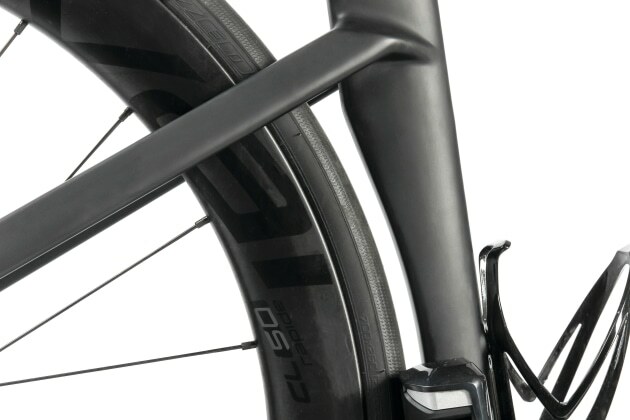 The combination of aero tube shapes, 50mm rims and disc brakes can catch gusts of wind more noticeably than a comparable ‘traditional’ setup. Prospective riders should also be aware that the new Venge is well and truly a race bike. Although it does feel relatively smooth for such a laterally stiff machine (assisted by the wide Roval rims and a recommended tyre pressure of 80psi) it certainly does have a ‘direct road feel’, especially on rougher roads. Specialized reckon you can fit a 32mm tyre into the frame: it may be worth investing in some wider rubber and dropping those pressures even further if you’re heading out on chipseal. The fact I’m even considering this as an option shows how much better this bike is than its predecessor – not just in terms of speed, but in versatility. Yes, it’s an aero race bike through and through, but it’s a race bike I’d be happy to ride pretty much anywhere. You can’t really fault the build quality or component specification on this bike – and if I can build one of these with no major issues, you know the design team at Specialized have done their job in making the integrated elements of the Venge user-friendly. Plus, that hologram effect on the decals, saddle and bar tape is on point. If you’re looking for an aero race bike that you could feasibly take on long gran fondos as well as the crit track, the Venge is a pretty attractive looking option. If anything, the Pro spec is the more versatile version of the bike when compared with the seriously sprinter-focused S-Works edition. But be warned – it’s still an out-and-out race bike, and feels like it both in terms of snappy handling and road buzz. Aero ain’t cheap. Even the ‘budget’ Venge isn’t a cheap exercise: at $9,400 you’re still firmly in second-mortgage superbike territory. If you’re looking for free speed, then you’re going to have to pay for it. I had to work pretty hard to find things I didn’t like about the new Venge: the ‘oil-slick’ coating on the supplied saddle is a bit slippery, I wish Specialized made the Aerofly II bars with a shallower bend for my childlike hands (they do, in a 38cm bar width), and I did get buffeted a bit in strong crosswinds on one ride. But all these criticisms are easily surmountable, whether with intelligent part swaps or adjustments to riding style. It’s fair to say that the crew from Morgan Hill have nailed the aero race bike again.